Why is algebra hard? For that matter, what is algebra? At first glance, we might think of it as the arithmetic of letters—variables like x and y—but if we take a closer look, there is something more going on. Algebra introduces a level of abstraction, a way of thinking and reasoning not about particular numbers, but numbers in general. 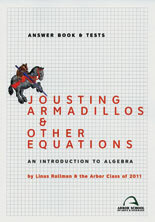 In Jousting Armadillos, Linus Rollman surveys the basic skills and techniques of algebra and explores the underlying concepts that give them their power. Ostensibly a middle-school textbook, the book eschews the traditional form. The style is conversational and collaborative. Problems and exercises are often designed to be engaged by students in groups and often appear embedded within the exposition. Short writing prompts encourage students to reflect on and write about their strategies and thoughts. The end result is an exploration of algebra that appeals even to the “nonmath” student. To be sure, Linus includes exercises for practicing skills, and by the final chapter, the studious reader will surely be proficient in the practice of algebraic manipulation. 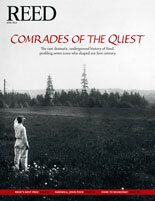 But the real gems here are the problems and activities that break from the standard mold. To introduce inductive reasoning, they build pendulums and observe the relationship between the length of string and the time to complete a swing. The game of 20 questions introduces the notion of deductive reasoning. Throughout the book, students must wrestle with problems that do not have tidy answers; they create their own puzzles and problems; they reflect on results and make conjectures about generalizations. In short, they do mathematics.